Today’s post is a good example of connected learning. 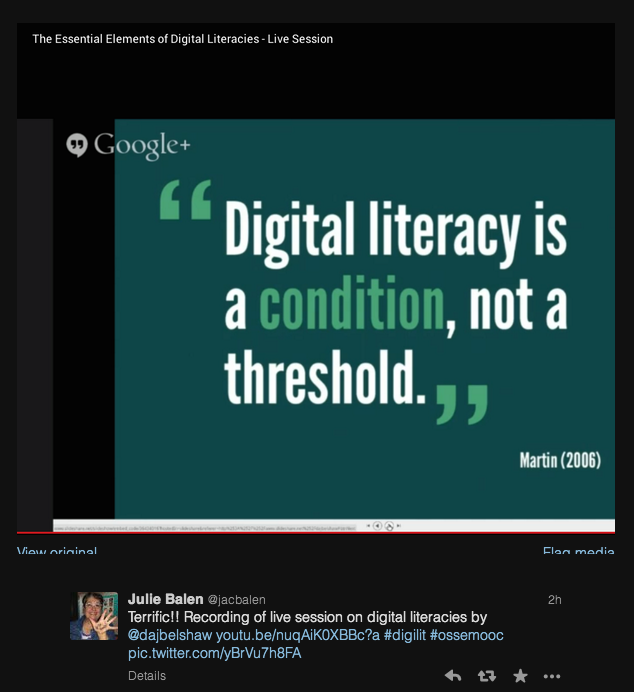 This recent tweet from Julie Balen resonates with me. Today’s post by Mark W. Carbone. 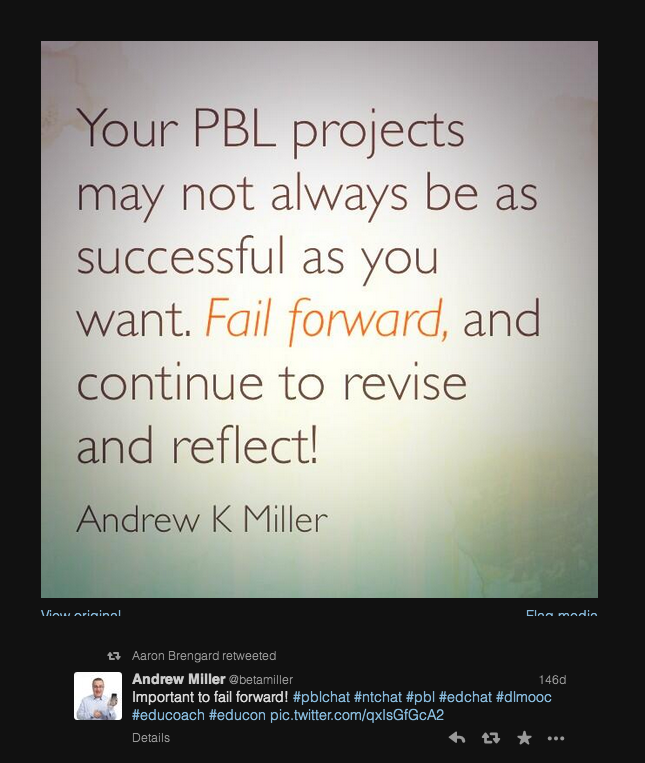 Today’s post compliments some of our related posts on Project Based Learning (PBL). Today’s Picture and Post shared by Mark W. Carbone. Today’s post is shared by Mark W. Carbone. Over the last 8 years, one of the constants in my personal growth path, has been through my association with Powerful Learning Practice. My PLP experiences as a learner, connector, collaborator, community builder and coach have truly been life changing for me. 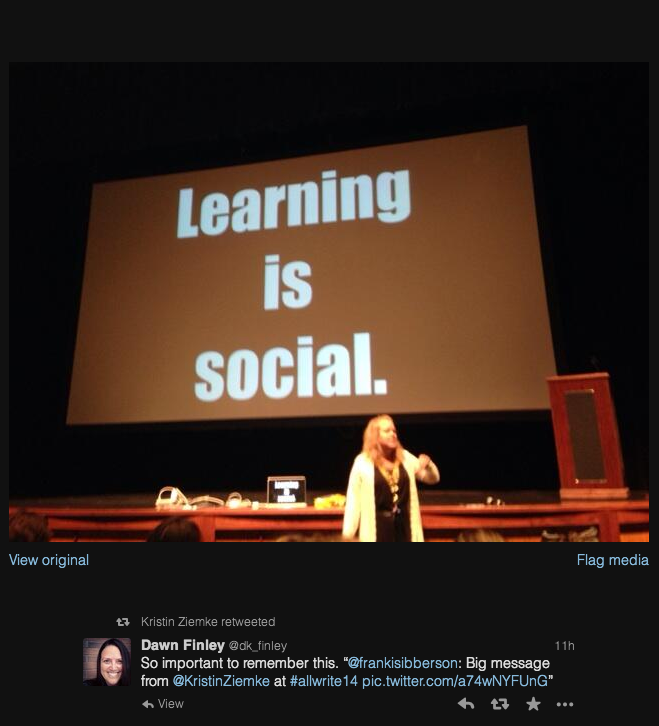 I continue to enjoy learning through the #plpnetwork twitter stream. This tweet seems to be a perfect fit to the theme of this Picture and Post collaborative blogging project. After reading Why I Would Not Go Back to Offline Teaching why not take a moment and share a reflection by leaving a comment here. We look forward to learning from your sharing. Here at #OSSEMOOC we are often asked questions like, “How do you find time to blog?”, or “How do I find good stuff online?”. While sharing tools is one approach to answering that question, I like to think of all of these activities as part of the process of curation. When you have a PLN with strong curation skills, navigating through the vast amount of information online becomes so much easier. In fact, curation is an important skill for everyone. Sue Waters (@suewaters) has very neatly and concisely explained the curation process. In this post, Sue takes us through the process of discovering and recording information that we need, organizing information, contextualizing, editing and making meaning and then sharing. She has also described the process in further detail on her personal blog. As you head into summer, consider how the suggestions in this post can help you make your own learning and sharing more effective and efficient. How can we help our students develop better curation skills? I spotted this Twitter post from Lisa Neale this morning. My initial reaction was why wouldn’t you start with a question? Perhaps we shouldn’t limit ourselves with a starting question. Read this interesting insight from Peter Skillen’s Construction Zone blog. In some ways, this picture says it all. I think the real question is: what does is look like in the classroom? – or the work place for that matter. Rows of cubicles are no different than rows of desks. Learning, and collaborating, in messy mode requires a shift. How do we build greater comfort and capacity to let go, let the messiness happen and let the students/staff benefit from less control and increased socialization? Please share. What does this look like, sound like and feel like in your classroom or work space? This picture and post was shared by Mark W. Carbone. Today’s Picture and Post is shared by Lorraine Boulos, Curriculum Consultant with HCDSB. Yesterday our curriculum department was involved in some pretty heady reflection about our current teaching practices as we participated in an in-services with presenters Jeff Kugler and Nicole West-Burns from the Centre for Urban Schooling. Here are some of the comments tweeted during and after our in-service. I think our learning led to more questions than answers, but it was a good awakening for us. I realize that I have carried many assumptions that I now need to challenge. Many of our conversations around eLearning in Ontario involve the idea of online course “content”. As schools make plans for online learning next year, teachers want to know, “Is there a course?”. Years ago, when I was teaching full time online, my principal often said, “We are not in the business of content delivery, we are in the business of learning!”. In one conversation about content this year, a teacher said to me, “Well, wouldn’t you just have the students build their own content?”. As we think about how our students learn, how does it impact our thinking about what online learning should look like? 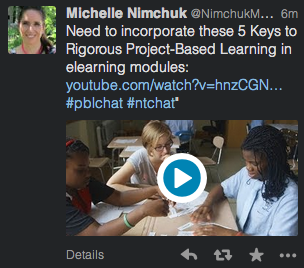 This recent tweet makes me think of iterative learning. How might this approach be beneficial in your classroom or the workplace?